Baked in muffin cups, these simple and scrumptious mini frittatas get a flavor boost from the addition of roasted red pepper hummus! Preheat oven to 375°F. Spray a 12-cup muffin tin with cooking spray or coat lightly with oil. Set aside. Heat olive oil in a large (12-inch) skillet over medium-high heat. Add onions. Cook and stir until onions have softened, about 4 minutes. Add mushrooms and cook until mushrooms are tender, about 5 more minutes. Continue to cook until onions and mushrooms begin to caramelize, being careful not to burn them, about 2 more minutes. Add spinach and cook until wilted, about 2 minutes. Remove vegetables from heat. 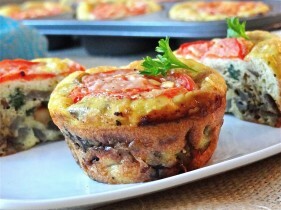 Spoon vegetable mixture evenly into muffin cups. Top with Parmesan. Lay one thin tomato slice over cheese. Whisk together eggs, hummus and pepper until well blended. Slowly pour over vegetable-cheese mixture. Cups will be full. Bake for 25 minutes. Loosen frittatas from pan by running a small knife around edges and serve hot.